Amelanchier, Cornell Pink Azalea and Gingko Flowers. Spring is busting out all over. This week we have jumped from the cooler temperatures right into the warmth of summer like weather. It is almost like we didn’t even have a spring after that long winter. 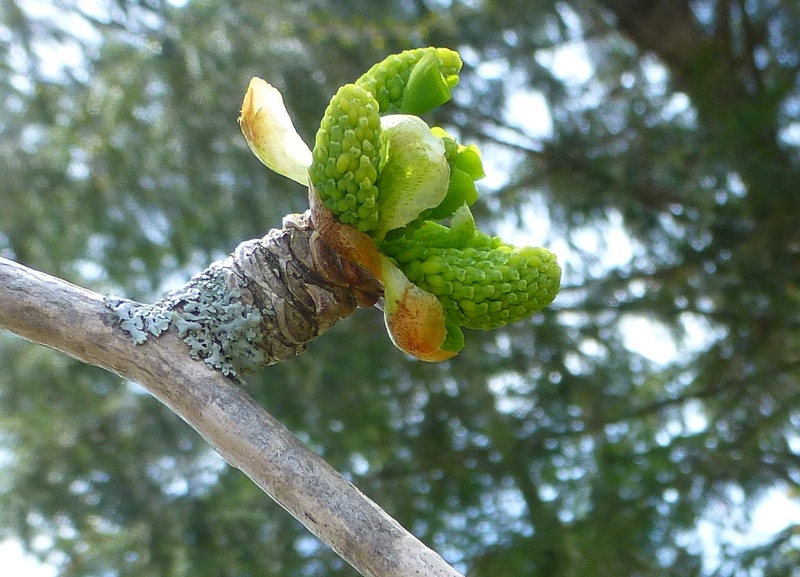 For plants, this means a huge jump in pushing out their spring flowers and leaves quickly, denying us the weeks of leisurely enjoying the blossoms as they slowly open, instead now they are rushing to develop as the heat is hitting. The plants are as rushed as we are. This week, two of my favorite spring bloomers, Shadblow and Cornell Pink Azalea, popped open and are already starting to fade after just a few days. 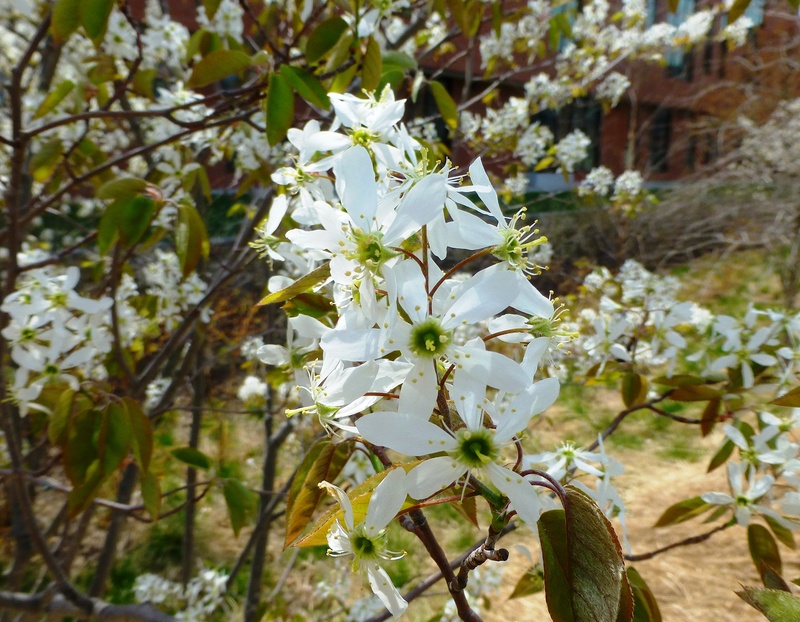 Amelanchier canadensis is commonly called Serviceberry or Shadblow is a wonderful small, native tree.Other names for the shrub or small tree are Juneberry, saskatoon, and sugarplum. The tree grows to only 20 feet and appears airy with leaves on the smaller side of 1 1/2 to 2 1/2 inches long and one inch wide.It looks good in all seasons with its grey, striped bark and multi-stemmed habit. In the wild, colonies form into a thicket when it is left to produce suckers from the bottom. Single plants can be pruned up into a tree form. 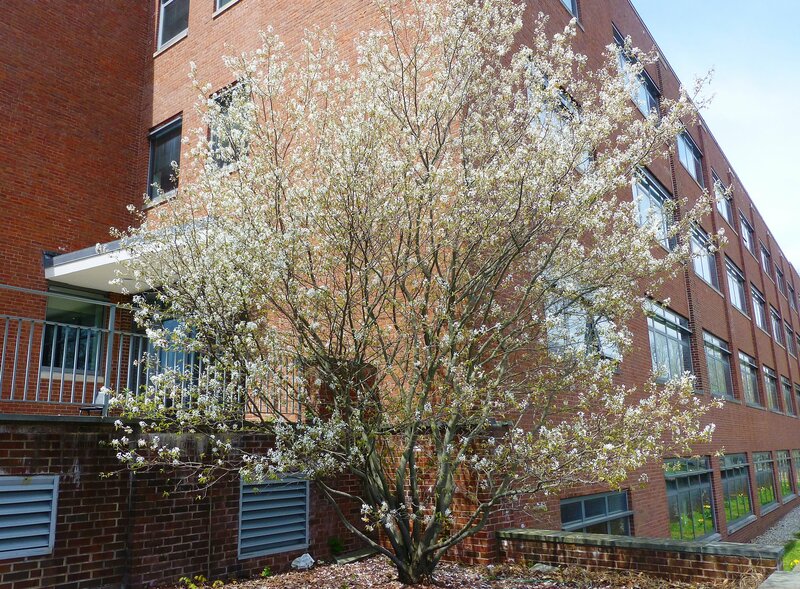 Serviceberry is hardy to zone 3 growing from Maine south to the Carolinas. It can be found in swamps, water edges and bogs as it likes wet feet and moist soil. However I have seen it grow happily, even thriving in drier situations proving its adaptability. The white spring flowers are 2 to 3 inches long with obovate petals. The flowers come out before the leaves emerge. After flower petals drop, red fruit is produce during the summer. The fruit will turn black when ripe. The fruit is tasty and edible, but difficult to harvest before the birds strip the tree clean. The leaves are a common host for several caterpillars ensuring a population of butterflies nearby. The common name Shadblow comes from the timing of the white flowers blowing on the wind at the same time the shad fish are spawning in the Connecticut River. This might just be local folklore, but I have heard it many times from shad fishermen. Several named varieties are in cultivation and marketed under the names and description as follows. ‘Glennform’ (Rainbow Pillar®) – Has an more upright, shrubby growth habit, good for hedging. 20 feet tall. ‘Prince William’– Shrub habit, 10 feet tall, with good, multi-colored fall leaves and good fruit set. ‘Sprizam’ (Spring Glory®) – A compact shrub, 12 feet tall, 8-10 feet wide with yellow-orange fall leaves. ‘Trazam’ (Tradition®) – More of a tree variety, growing 25 feet tall with a central leader and good fall color. Cornell Pink Azalea is an early spring bloomer bursting out in clear pink blossoms before it puts out leaves. Usually covered with flowers from bottom of stems to their tops. Their are several varieties of Rhododendron mucronulatum but Cornell Pink is most commonly found in the trade. There is also a variety sold as ‘Storrs Pink’ but appears to be the same as ‘Cornell Pink’. Both are very reliable, hardy plants, providing bright, spring color every year. 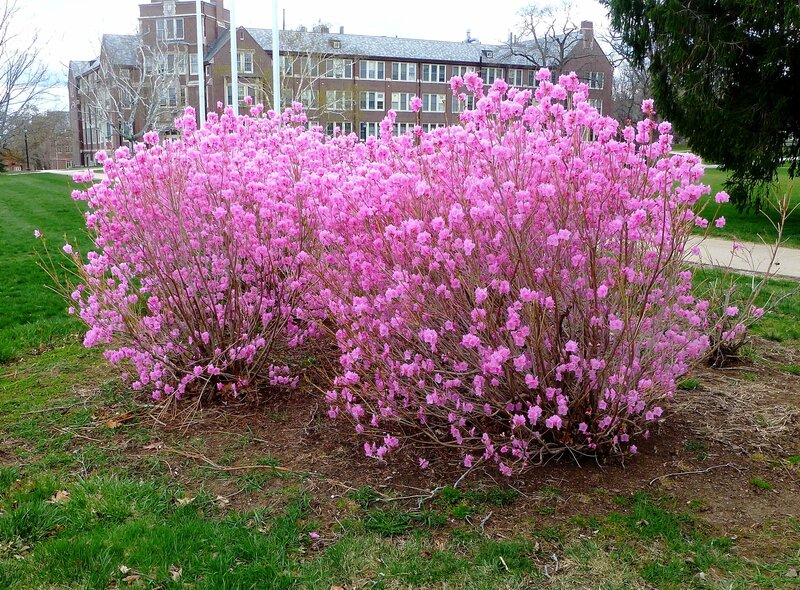 The shrub is 4 to 8 feet tall and wide making a nice mound of flowers in the spring and green foliage in the summer. Fall leaves will be yellow to orange before the drop for the winter. Summer fruit is a small capsule, not normally noticed or significant. Rhodendron mucronulatum is native to China, Korea and Japan. It is hardy to zone 4 and prefers full sun to light shade for best flower show. Provide good drainage, acidic soil and high organic matter to keep this shrub going strong. It looks beautiful in a mass planting in a large space backed up by evergreens. Another favorite tree showing its beautiful flower buds is Gingko biloba. This is a male flower on a male tree. The flowers are produced on the shortened spurwood, which are compressed, never growing long. You can see the many years of growth rings just below the bud. Lichen is growing on the stem just below the spur containing the flower, adding a bit of interest to the photo by my co-worker, Pamm Cooper. Female trees have female flowers and produce a fruit which, when ripe, smells a lot like vomit. I suggest if you are purchasing a gingko tree, chose a male.